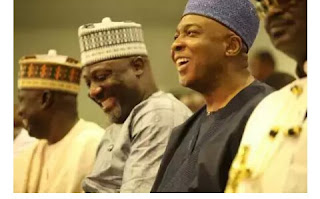 Senator Dino Melaye the lawmaker representing Kogi West district, has boasted that nobody can remove Senate President Bukola Saraki in reaction to a statement made by the National Chairman of the All Progressives Congress, APC, Adams Oshiomhole late last week. Oshiomhole had stated that Saraki must be removed as Senate President given he left the party he was elected from. Since Saraki’s controversial defection from the ruling APC to the opposition party, the Peoples’ Democratic Party, PDP, he has been subjected to immense pressure from APC to force him to surrender his seat. Melaye’s reaction came during an appearance on Channels Television’s political programme, Sunday Politics. While speaking on the programme, Melaye, who had also defected to the PDP from APC made light of Oshiomhole’s call to unseat Saraki, insisting that no one can ‘remove’ him as Senate President. “Unfortunately, Adams Oshiomhole as an individual has no vote either to keep Saraki in office or get him impeached. “When he said that it’s a crown, that the crown belongs to APC; I want to educate and inform him that the Senate Presidency of the Federal Republic of Nigeria is not a title. “It is not hereditary, you don’t beget it. it is for the Federal Republic of Nigeria. It does not belong to a political party, it does not belong to a family, it is not a kingship or an emperor type of thing,” Melaye explained. “Senate President Bukola Saraki will be there for four years,” he stated.